Fully serviced en-suite bedrooms are set up in 15 cottage tents. Each tent is equipped with beds, comfortable duvets, cosy blankets, electric blankets and electric lights to ensure you wake up refreshed and rejuvenated. Ablutions include en-suite hot showers and chemical flush toilets (porta-loos), luxury amenities and towels. Namaqua Flower Camps are renowned for their delicious dining experience - aromas of bacon and eggs, delicious and wholesome picnic baskets, high tea, mini cheese boards and last but certainly not least hearty, satisfying dinners prepared in our remote kitchen by a private chef. Guests can enjoy a nightcap in the lounge after dinner before retiring to their warm beds and awake to tea and coffee served right outside their tents to start their day. Namaqua Flower Beach Camp is located just north of the Groenrivier entrance to the Namaqua National Park, right on the beach. All the tents have a gorgeous sea view, lovely beaches, plenty of rocks for sundowners, miles to walk and plenty to experience. Coastal flowers include gorgeous vygies and hardy succulents. Some might appear dry as a bone but are indeed very much alive. 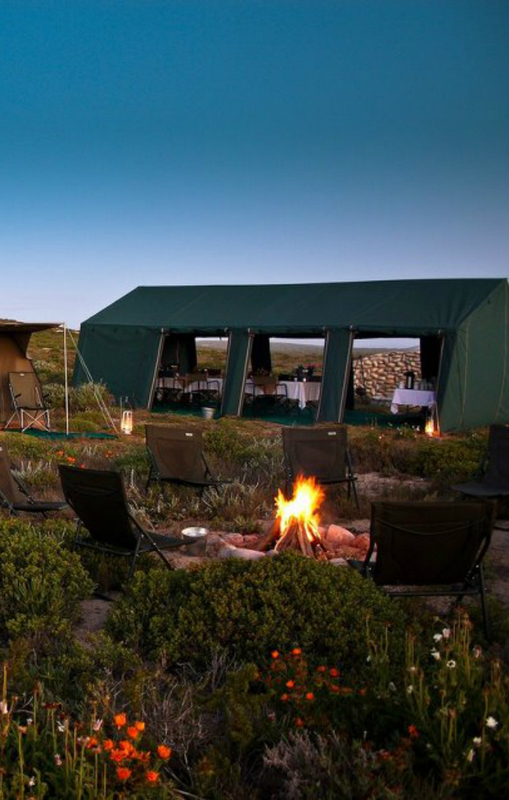 Namaqua Flower Skilpad Camp is accessed from the Kamieskroon turnoff in the Namaqua National Park. Inland flowers include a fair share of brightly coloured daisies but there is so much more than meets the eye. Incredible vistas, granite outcrops, rolling mountains and a bounty of birds and wildlife will keep you busy for hours!